Last time we had a tour over the experience of having your APIs protected by Azure AD. In this post I'd like to dive a little deeper into how you can better control access with roles that you can assigned to users and applications. (shown in red) A user tries to create a new facility in the system. (shown in green) A background process tries to process a batch update request that may involve creation of new facilities and updating of the existing ones. In both cases it makes sense to control who or what has permissions to make changes to facilities. Only users who have been assigned a role of 'FacilityOwner' can manage facilities and we want only the background processes that have been specifically assigned the 'ImporterProcess' role to be able to batch import facilities. The roles are app specific and it's a responsibility of the application to enforce them. In ASP.NET Core authorization infrastructure is coming with Microsoft.AspNet.Authorization package. This is where you're going to find familiar authorization attributes such as AuthorizeAttribute and AllowAnonymousAttribute, and some really cool stuff called authorization policies. With authorization policies you have flexibility to implement permission authorization checks that better suite your applications. You can check claims, roles, user names and of course come up with your own implementations. Pretty slick, huh? We've defined a policy and added a RolesAuthorizationRequirement with two accepted roles: 'FacilityProvider' and 'ImporterProcess'. RolesAuthorizationRequirement is going to be satisfied when an incoming request's ClaimsPrinciple contains either role (it applies Any logic when handling authorization). The policy is considered satisfied when all of its requirements are satisfied and in our case there is only one requirement. As expected we get a cold 403 response meaning that the token has been validated and the ClaimsPrincipal has been initialized however according to our authorization policy the principal lacks required roles. Every application in Azure AD allows you to define app specific roles that can be assigned to users, user groups and applications. As we have already started testing the importer scenario let's assign the 'ImporterProcess' role to the client process app. But first, the role needs to be defined in the API app itself. That is, the API app exposes a bunch of its roles that can be assigned to consumers. Make sense? The properties are pretty much self-explanatory. You need to assign a unique ID to the role and decide who or what can get assigned the role. This is controlled by the allowedMemberTypes collection. In this case I want this role to only be assigned to applications, not users. Now we need to upload the modified manifest back to the BookFast API app by using the same 'Manage manifest' button on the portal that we used to download it. It's worth noting that the assignment has to be done by an administrator. Let's request a new access token and repeat the attempt to add a new facility. Sweet! But how did it work? If we look at the new access token we will find out that a claim of type roles has been added by Azure AD. The claims contains an array of roles that apply to the context in which the access token is requested. That is, if we request a token as an application we only get roles that have been assigned to the client application and if we request a token using a delegated flow we will get roles that have been assigned to a user that the client app acts on behalf of. As you know, we use Microsoft.AspNet.Authentication.JwtBearer package on the API side to handle the token and it ultimately relies on System.IdentityModel.Tokens.Jwt package to actually parse the token's payload. It creates an internal representation of the token (JwtSecurityToken) with claims that have their types defined by mapping shortened versions of claim types found in the token to claim types defined in the familiar System.Security.Claims.ClaimTypes class. So the roles claim gets mapped to http://schemas.microsoft.com/ws/2008/06/identity/claims/role. When the ClaimsIdentity is being initialized it gets populated with a collection of claims (System.Security.Claims.Claim) and it's also given claim types that should be used to look up 'name' and 'roles' claims. By default, these are 'http://schemas.xmlsoap.org/ws/2005/05/identity/claims/name' and 'http://schemas.microsoft.com/ws/2008/06/identity/claims/role' respectively but it can be overwritten with TokenValidationParameters when configuring the middleware. You want to do that when your STS uses a different convention but with Azure AD you go with defaults. This all makes it possible for RolesAuthorizationRequirement to rely on the familiar IsInRole method that it calls on the principal when authorizing requests. Before we move on I'd like to show you how role assignments are reflected in Azure AD application model. But that requires that you have at least some familiarity with it and have an idea of what a ServicePrincipal is. 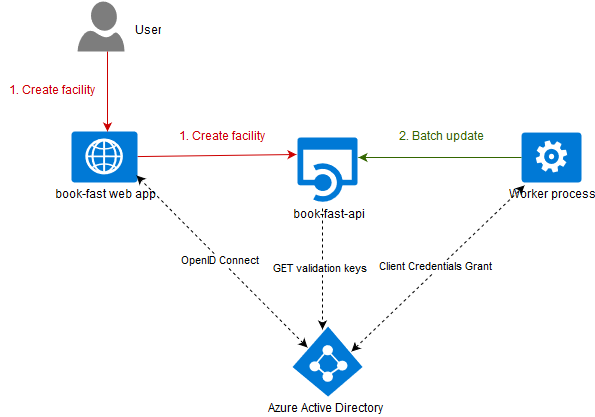 So far we've worked with 'applications' on the Azure portal but you should be aware that there are distinct concepts in Azure AD: Applications and ServicePrincipals. Applications can be thought of as blue prints that define your apps, whereas ServicePrincipals are concrete representatives of the applications in particular tenants. When you define an app in a tenant it automatically gets its principal in that tenant. However, one application can have multiple principals defined in different tenants. Think, for exampe, of an app created in tenant A that allows users from other tenants to access it. Apps like this are called multitenant. When a user from tenant B gives her consent to the app from tenant A a ServicePrincipal for the app is created in tenant B. This principal is a concrete representative of the app in tenant B. You can read more on these essential concepts here. Now before we can look at role assignments we need to find a ServicePrincipal for the BookFast API app. We're going to use a convenient tool called Graph Explorer that allows us to query Graph API of Azure AD. I omitted a lot of properties but left some of them so that you can have a sense of what it looks like. You probably have recognized our 'ImporterProcess' role that got inherited from the Application object. It makes perfect sense because the Application may be defined in another tenant and we need to be able to assign roles to apps and users from the consuming tenants thus we need to represent the exposed roles in the principal objects. Every object in Azure ID is identified by its unique objectId these object ID's can be used to directly access object as well as to glue things together. Here we see an assignment of principal 'book-fast-internal' (which represents a client app for the importer process) to a resource 'book-fast-api' (which is the ServicePrincipal of BookFast API as you can tell by its objectId 'f4b5edd0-82f6-4350-b01b-43ecc24f5b4a') in the role of '17a67f38-b915-40bb-bd09-228a5c8a997e'. If you scroll up a bit you will recognize the role's ID as it's the one we used for the 'ImporterProcess'. Notice the principalType value that indicates that the assignment was done to a ServicePrincipal, that is, to an app, not a user. We've created a new ID for the role and set allowedMemberTypes to 'User' as opposed to 'Application' that we used previously. When we allow to role to be assigned to 'User' can be assigned to both users and groups. Note that allowedMemberTypes is actually a collection and we could have reused our previous 'ImporterProcess' role to enable it for users too. 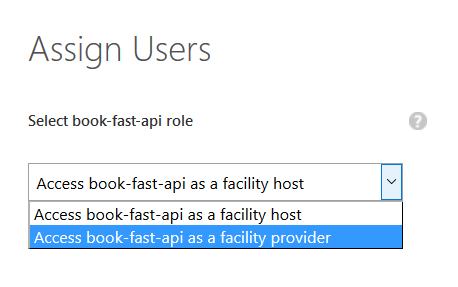 However, in BookFast API these are separate roles and thus we reflect that in the AD app. Spot the difference? Yes, principalType is now 'User'. Another possible values is 'Group' if roles are assigned to directory groups but it's supported only in the paid version of Azure AD. One more thing I'd like to mention before I wind up this post. By default, user assignments are not required meaning that any user of the tenant can request access to an app. The roles claim in their tokens will be missing and your API will reject requests with these tokens if your authorization policy requires a certain role to be present in the token. In some scenarios you may want all users to be qualified by roles and enforce user assignments for your apps. There is a special option on the 'Configure' tab to enable mandatory user assignments which is reflected in appRoleAssignmentRequired property of the ServicePrincipal object. Why principal? Because it's a tenant specific setting: some may require it, some may not.